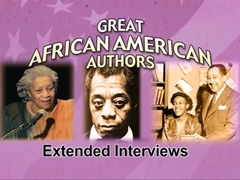 In the series Great African American Authors - Extended Interviews, top African American scholars from across the country provide in-depth analysis of the lives and works of over 50 of the nation's greatest black novelists, playwrights, poets and essayists. In addition, the series provides an overview of the rich 400-year-old African American literary history, with spotlights on the Harlem Renaissance and the Black Arts Movement. Dr. Bradley starts out with in-depth analyses of three of the prime literary innovators of the Harlem Renaissance: James Weldon Johnson, Langston Hughes and Zora Neale Hurston. Next, he brings to light Ralph Ellison’s monumental novel Invisible Man. Then he finishes Part One with the writings of Alex Haley. Dr. Bradley begins Part Two with The Autobiography of Malcolm X. This is followed by portrayals of the two iconic female African American writers, Maya Angelou and Alice Walker. He continues with two contemporary black poets, Cornelius Eady and Natasha Trethewey. And Dr. Bradley concludes with a brief history and evolution of African American literature. Dr. Gabbin is a distinguished scholar and friend of many contemporary African American authors. She begins Part One with a unique personal perspective on black writers starting with one of her favorites, Sterling Brown. Finally, she turns to writers that were productive during the Black Arts movement, Gwendolyn Brooks and Amiri Baraka. In Part Two, Dr. Gabbin recounts the lives and poetry of her friends Nikki Giovanni, Lucille Clifton, Yusef Komunyakaa and Rita Dove. Dr. Green continues Part Two with an account of Malcolm X and his autobiography. She concludes with commentary on two post civil rights authors, Gloria Naylor and Ernest J. Gaines. Dr. Sheila Smith McKoy begins with the relationship between African American oral tradition and African American literary tradition. She follows this with readings and interpretations from the first published African American poet, Jupiter Hammon. Next, she provides a brilliant portrayal of the Harlem Renaissance along with three of its prominent writers: Jessie Redmon Fauset, Alain LeRoy Locke and Paul Laurence Dunbar. She then moves on to analyses of playwrights Alice Childress and Suzan-Lori Parks. She concludes with a personal account of the iconic Maya Angelou. Dr. Ross begins with two Harlem Renaissance writers, Arna Bontemps and Countee Cullen, and then moves on to Richard Wright, who many consider to be the father of black protest fiction. Next, he takes you through James Baldwin’s great novel Go Tell It on the Mountain and his famous essay The Fire Next Time. This is followed by an analysis of two post-desegregation popular novelists E. Lynn Harris and Chester Himes. Dr. Ross concludes with a brilliant history and evolution of black literary themes. Dr. Shiu, begins with an in-depth analysis of black activist W.E.B. Du Bois’ early literary efforts and follows with a brief introduction of Ralph Ellison’s Invisible Man. He then moves on to James Baldwin in his groundbreaking collection of essays, Notes of a Native Son. Next, he takes you on a journey through two of Toni Morrison’s better-known novels and Dr. Shiu ends with one of his favorites, the best-selling black detective novelist Walter Mosley. Dr. Williams introduces you to Phillis Wheatley one of America’s first black authors. She then comments on James Baldwin as an essayist. She moves on to playwrights Lorraine Hansberry and August Wilson. In addition she talks about one of America’s lesser-known black authors, Toni Cade Bambara. From there she guides you through the writings of one of her favorites, Toni Morrison, and finishes with a look at newly emerging African American literature. Copyright ©2016 Ambrose Video Publishing, Inc.